PUNTERS could be forgiven for having to check their programs at the start of The Smashing Pumpkins' Splendour-closing set last night. The band started playing a few minutes early and opened their show with a song sung by drummer Mike Byrne, which had many under the Supertop double checking they were at the right tent. But the festival weary crowd, on their last legs after three days of music revelry, was quickly rewarded with classic songs Zero, Bullet With Butterfly Wings and Today in quick succession. 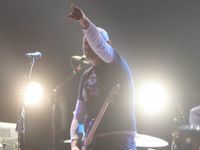 Front man Billy Corgan acknowledged the thousands who stuck it out to see the alternative rockers. "Thank you so much for sticking around," he said. "How you doing? Don't (expletive) lie to me, you're tired." The set also included 1979, Tonight, Tonight, the title track from the band's new album Oceania and a cover of David Bowie's Space Oddity for the encore. Earlier, The Kooks' only Australian show of the year was briefly stopped about 20 minutes in when a punter scaled one of the poles of the Supertop. Metric also had a slight stoppage of their set when power was cut to the big screens flanking the stage. Missy Higgins' hour-long set was one big sing along with dedicated fans filling up the GW McLennan tent. Higgins played four songs from her long-awaited release The Ol' Razzle Dazzle and described the album as a "love letter to music". "I wrote a lot of songs to deal with my very tumultuous relationship with music," she said. 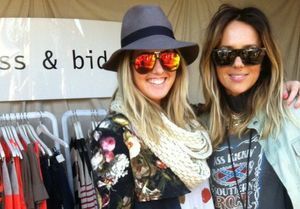 Celebrities spotted over the three-day festival included comedian Chris Lilley, footballer Greg Bird and radio personality Ryan "Fitzy" Fitzgerald.